A kitchen fire can be devastating. It can happen to anyone, in any kitchen. Even if you maintain your kitchen, there is an increased risk of a fire occurring due to the cooking you do here. With home insurance, you have financial protection for your assets. It can help you recoup the losses and help with the repairs. How does coverage work for a kitchen fire? Before anything else, your home insurance company needs to know what caused the fire to occur. In some cases, it may be the result of an electrical fire. It could be the result of a mistake, such as leaving a towel too close to the stove. In these cases, your policy works to help you cover the losses. In other cases, it may not. Most policies do not cover damage related to poor maintenance and upkeep. For example, if your kitchen has a large buildup of material due to poor cleaning habits, it may not always cover the losses. If you intentionally set the fire, or do so through reckless actions, your insurer may not provide coverage. However, if a faulty wire in the over sparked the fire, you might have coverage. You likely did not know it was there. When you have a fire, your goal is to put it out as quickly as possible to minimize damage. Never put yourself in danger. Call the fire department. Then, after this occurs, call your home insurance agent. Your agent can visit the home, look at the damage, and determine if a claim can occur. If so, several things happen. The insurance company hires someone to clean up the water damage and debris. This is generally unsafe to do on your own. They bring in a contractor to determine how much the repairs are. You may be able to use your own contractor if you have one if licensed and bonded. The work gets underway. The policy may pay for your losses, including the construction costs. It may pay to replace lost personal items in the fire, such as your furnishings. If you cannot live in your home due to the repairs, your policy may also cover additional living expenses. This includes costs related to renting a home during the repairs. Your home insurance is there to cover incidents like this. Work with your agent to get the work done properly. 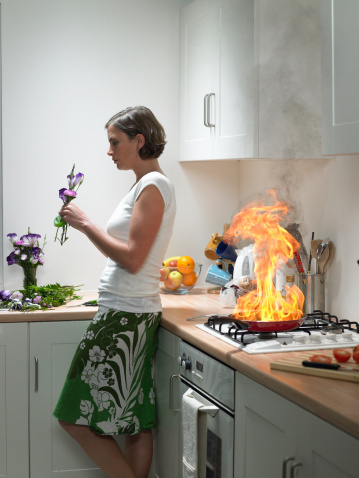 A kitchen fire can be a high-risk scenario. Do what you can to minimize them from occurring. Also Read: Will Home Insurance Cover Damage From A Plumber?